Matt and I don't normally revisit recipes. We make a test batch, again for the video and pictures and then we move on. But, these Gluten Free Sugar Free Cookies changed that for us! It was only two days after we made the video and picture batch that we polished them off and found ourselves making them again. They are packed with seeds and fiber, and have the perfect crunch to them! Watch Matt make them below and then go ahead and make them for yourself and your family! I'm a huge fan of cookies for breakfast, and my favorite kind are any that have a big crunch! This cookie hits both of those check boxes - they are healthy enough to eat as a breakfast cookie and crunchy from start to finish. What makes them the ultimate breakfast cookie is all the great ingredients they are packed with. 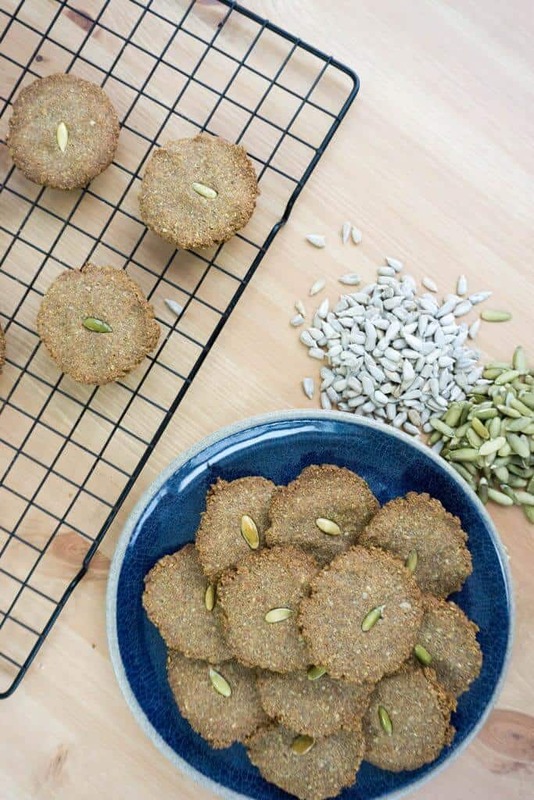 The seeds and fiber found in these cookies will keep you full and energized all morning! Always On The Search For A Nut Free Snack? Well, look no further! I may not have mentioned this already, but these cookies are nut free, which is a huge win for me and anyone else with nut allergies. They are densely packed and filling like you would get from a nut filled cookie, but without the nut. It's also a win for those who can eat nuts, since nuts can run high in calories and cause digestive discomfort if eaten in excess. I've eaten well over 5 of these cookies in one sitting with no issues at all! Win! In the coming months, we are traveling quite a bit, and the first thing I thought to pack was these cookies. They are the perfect travel snack since they are super filling and will last about a 8 days out of the fridge! Some other great travel snacks are our sugar free graham crackers and low carb peanut butter! However, my ultimate recommendation would definitely be these gluten free sugar free cookies. Recipe can be quickly added to MyFitnessPal - Search "KetoConnect - Breakfast Cookies"
Combine all the dry ingredients in a blender or food processor. Set aside. Combine butter, stevia and extract into a bowl and combine using a hand mixer. Add the eggs and combine again. In two parts add the dry to the wet ingredients as you combine with the hand mixture. Using a cookie scooper or spoon make 16 cookies, placing them onto a baking sheet with parchment paper. Flatten them out before putting them in the even as thin as you'd like because they will not spread in the oven. Place the cookies in a 350 degree oven for 25-28 minutes. Oven temps vary so keep an eye on them! Allow to cool on a baking rack. Enjoy! Shelf stable for up to 10 days or in the fridge for 3 weeks.